I agree with you, and I would add that t would be vain to think that the reality is only what we can feel with our five senses. It would be pretentious. I believe that there is so much more than what we can perceive! Hey Yannie! Wow, I do hope you'd find yourself in our shores one time. Yup, there are highly reputable crystal stores in many of our behemoth malls, and they do have pretty extensive collections. But since they must pay a premium for renting space, it adversely impacts the prices of their wares. Because of this, I mostly source my crystals through highly trusted private dealers. I do not know how their mall store prices compare with other Asian countries. Although we have an extensive mining industry, we focus more on minerals rather than crystals. There are still some local crystals, like serpentine, tektites, etc. that you can get for a steal though. BUT if you are on the hunt for pearls, then you can hardly do better than here. It's my mom's birthstone, and her eye for these babies (and diamonds) is basically peerless. Her collection is STUNNING. There's a not so fancy array of shops right here in the capital that looks like Neptune opened his trove right smack in a tropical concrete market. I know my fellow Manileños know or have heard of this one. Ropes and handfuls and clutches of pearls, either by their lonesome or finely set, at hyper-competitive prices. This is a place that society matrons and diplomats' wives and, some say, even European royalty have graced. They sell all kinds and hues, but nothing beats the glory of our inimitable Golden South Sea pearls. We make it a point to take our female American clients to this market, and they are downright gobsmacked at the prices. They keep on asking "This is genuine, right? No really? Are you kidding me?" And that is before my female colleague begins to haggle. After that we're all pretty much friends for life. A few tips though: wear dowdy clothes, and make sure you have a companion who knows her pearls, and who has shopped there a few times. The bargains that would rain down would have you leaving the market feeling like Christmas morning. I guess this is one of the reasons why the Philippines is known as the Pearl of the Orient Seas. Thanks for the heads up. I guess for these kinds of stones, you'd have to go to an established and reputable brick and mortar crystal shop. Once you buy them, have them verified by an expert and storm the store if you find out it's a fake. It's just that these are so rare and so expensive here. I think the price per gram here is about 3 times that in the US? And to think these are all sourced solely from the Czech Republic. FINALLY! 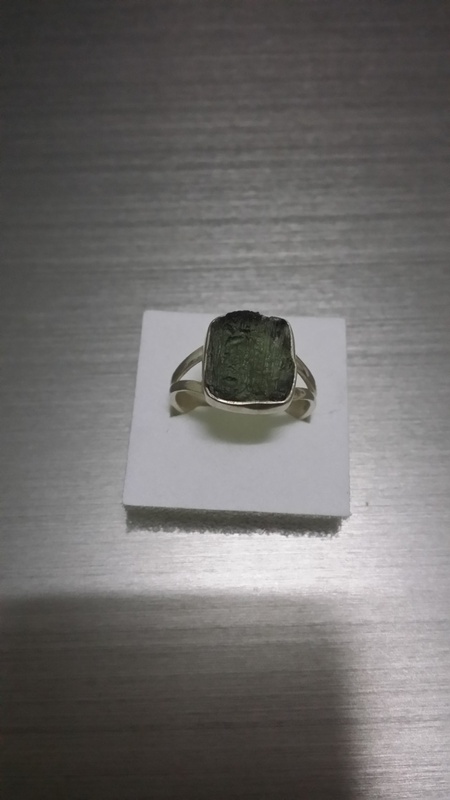 Just bought my new moldavite ring from a reputable crystal shop here. It's a size 10 so I can only wear it in my pinky. I can't wait to work with it. I also bought a set of 7 engraved chakra stones. Oval-ish and flat, I think they'd be perfect for crystal meditations, in tandem with Tomas's Chakra Crystals book set I bought a while ago. Add Grilley's Chakra Theory and Meditation videos and I'm pretty much all set. Wow, great finds. I especially like the sound of the engraved chakra stones and the chakra book and videos. Enjoy working with your new purchases! Thanks a lot, RiverRunsDeep. I blocked off my Sunday so I can at least have a full day of working with them. Once I get to (and hopefully master) more advanced studies on crystals and chakras, Reiki would be the next logical step. I hope to one day be adept at it like you. ooooh!! !Empyrean Knight! I love love love both of them!!! That ring is really gorgeous!!! and I do also love the bracelet. But the ring really catches my eye and takes my breath away. Do keep us posted on how each work with you as you wear it and find out. I'll be very interested in knowing and I hope that they both bring you all you desire! Awww, it is sweet of you to say I am "adept". I have simply practiced it for many years, love it immensely, and recommend it to anyone who will listen! I am always open to sharing Reiki information, experiences, and stories, once you begin working on it. Good luck with your studies. Oh wow, thanks Celticnoodle! 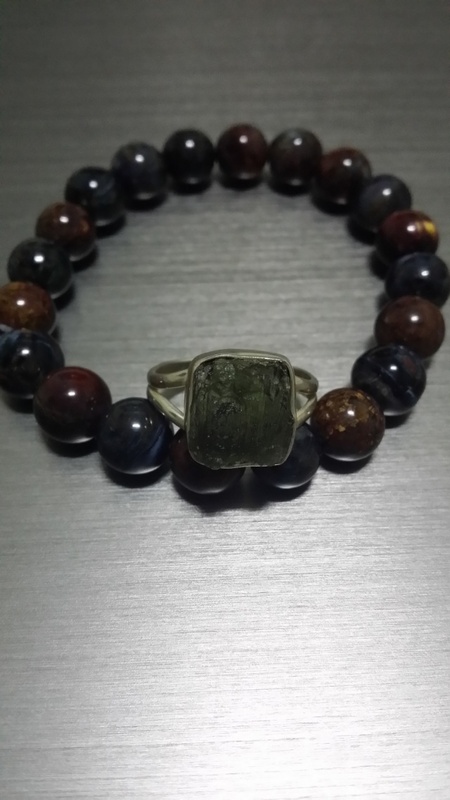 I would really have to thank all our friends here for their tips on how to purchase moldavite carefully. I'm happy to have snapped a genuine one that I fully resonate with. I've been working with it for the past three days, twice by its lonesome and twice with my favorite prehnite. The first time I held it, it seemed like nothing really happened, so I took it for what it was. But then it struck. I always thought there may be other more mundane reasons when people mentioned they get headaches working with it - they may have had a rough night, were stressed at work lately, had brief spikes of hypertension to which they suddenly became sensitive to, etc. But yep - it happened to me. The whole day (heck, the whole week) I was totally in the pink, being my normal active self. For the first few minutes I wore it, it was no big deal. Then it slowly struck, caressing my head at first like a threatening nimbus, before it developed into a full-blown headache. I was somehow expecting something else - something mild like a tingling sensation or a heat flush. Only when I became very dizzy did I remember that it was one of its possible effects too. The second time I wore it, it was still by its lonesome. I'm stubborn that way. I tried to man up and do the mind-over-matter thing, but after 20 minutes I really had to remove it. On the third time, I wore it with my favorite prehnite. I lasted a bit longer, but before an hour's up, I had to remove it again. I again wore it with prehnite during a Tarot reading yesterday. I was apprehensive that it might fog my mind and impact my session, but since it was pretty quick, I was not affected negatively. I removed my ring as soon as it was over. I have to say though, the reading felt very different in a rather positive way, despite the possibility of pain hovering throughout its entirety. I can't really put my finger on it. I guess I have to acclimatize myself with it, wear it for a bit longer every succeeding day. This time I'm teaming it up with pietersite - perhaps it would help with the dizzy spells. Geez I sound like a virgjnal Victorian waif. Anyway, I may on the other hand try gold sheen obsidian with it when I'm outside. It is reliably grounding, but it does not cancel the higher chakras as other stones like it is prone to. I think it's gonna be an interesting week.